The US Wine & Beverage Expo returns to Washington, DC, February 21 – 22. Launched by the Wine Industry Network in 2016, USBevX was started with the goal of establishing a world class conference and trade show specifically for the eastern U.S. wine industry. The 2018 conference theme is ‘In Pursuit of Excellence’ in acknowledgment that every great wine region shares a common obsession, quality above all else. I’m returning to the conference this year to participate as a panelist and to moderate a panel—The Next Generation: Winemaker’s Perspective on the Future of Wine in the Eastern U.S.—on Wednesday, February 21. I invited three winegrowers to be panelists based on their wine accomplishments, exceptional reputations, and commitment to winegrowing in their respective regions: Marin Brennan, Assistant Winemaker, Bedell Cellars, on the North Fork of Long Island, New York; Krista Scruggs, Assistant Winemaker & Winegrower at La Garagista Farm & Winery in Vermont (and ZAFA Wines); and, Nate Walsh, Winegrower, Walsh Family Wine in northern Virginia. Marin, Krista, and Nate, will share their experiences, the importance of mentors, discuss establishing their own identity and style, and their perspectives on the future of winemaking in the eastern U.S.
To introduce each panelist to conference attendees, I will post interviews with Marin, Krista and Nate over the next two weeks. While studying at Johnson & Wales University, a career in the wine industry was always Brennan’s the goal. Upon completing her Bachelor’s degree in Hospitality Management with a concentration in Beverage Service Management, she made a decision that would quickly jump start her career. Marin started with Bedell in 2010 as a tasting room employee and transitioned into the cellar for the 2011 harvest. 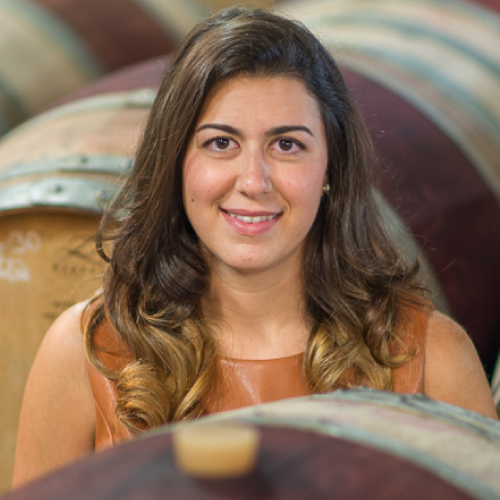 Within three years, hard work and passion led her to become Cellar Master. She has been the Assistant Winemaker since 2015. Marin has worked under the tutelage of Bedell Winemaker Richard Olsen-Harbich, who created all three Long Island American Viticultural Areas (AVAs) and the Long Island Sustainable Winegrowing program. Working alongside two North Fork pioneers, Rich and Kip Bedell have inspired her career immensely. Bedell Cellars is one of the East Coast’s leading wine producers, creating award-winning, world-class wines with sustainability farmed grapes and indigenous fermentations. How did you choose to work in the wine industry in Long Island? In a way Long Island chose me, I was attending Johnson & Wales University studying beverage management and was looking for a tasting room position. Bedell Cellars hired me and the relationship has grown from there. I’m a Long Island native and wanted to create a career in a place that personally means a great deal to me. Describe your winegrowing philosophy; what are you trying to achieve with your wines? Bedell Cellars wines define the emerging North Fork style: Moderate alcohol, naturally crisp, with distinct saline minerality. We have fine-tuned our techniques over 34 vintages to work in harmony with our unique Maritime terroir. Here we create wine using indigenous yeast, no chaptalization, little to no acid additions and minimal use of newer oak. Mentoring is important to navigating the wine (and life) learning curve; who has played an important role your winemaking career so far? Rich Olsen-Harbich, Winemaker, and Kip Bedell, Founding Winemaker, are my wine mentors. You’ve worked with Rich at Bedell for eight years. Share a fond memory of time spent in the vineyard with Rich or conversation over a glass of wine. Rich and I have been working together for 8 years now; he’s a wealth of knowledge and my rock since starting this journey. It’s a popular choice in our industry to work a harvest abroad. I was faced with this decision early on in my career and went to my mentor for guidance. Rich sat me down and said “Whatever you decide I’m behind you.” Then asked me, “Ultimately where do you see yourself making wine?” my response was, “Here on the North Fork.” I’ve been working alongside him ever since. What is the one myth about wine that you would like to see ended? That wine is pretentious, I’d like to see consumers become confident in their ability to taste, judge, and choose a wine. ‘Natural wine’ continues to be a polarizing topic in the wine world, what are your thoughts on this subject? Bedell produces sustainable wines which has a different philosophy than natural wine. Long Island Sustainable Winegrowers (LISW) is a program that’s been established since 2012 and focuses on sustainable viticulture. LISW has pulled together the most successful aspects of traditional, organic, and biodynamic farming that work specifically for our region and have a track record of success. Practices from BioDynamic farming: holistic approach to composting – all grape pomace has to be returned to the vineyard of origin and LISW requires a bio-diversity zone for all member vineyards. Traditional: certification of new vine plantings (2010 protocol) soil and petiole testing, bird netting, some non-organic spray materials are allowed but strictly limited in number of applications. We do approach this from more of a sustainable model – utilizing decades of knowledge and implementing “Best Practices” in order to make the most delicious wines we possibly can. This sustainable approach is more of a science-based philosophy which is often lost on natural wine devotees. It’s not an ideology but instead is open to new ideas and information. In order for our region to make wines that sincerely reflect their place of origin; they need to be free from microbiological spoilage which can transform a terroir-based wine into just another example of a wine with flaws which ultimately erases the subtleties of what the terroir gave you in the first place. What would readers and conference attendees be surprised to know about you? Bedell is the first and only winery I’ve worked for. Please check back on Thursday for the Q&A with winegrower Nate Walsh.